Is Iraq War End a New Day? Exclusive: The departure of the last 500 U.S. combat troops from Iraq in the predawn hours on Sunday marked an anti-climatic end to a near-nine-year war that began with “shock and awe” and “embedded” journalists joining the invasion force. But Robert Parry wonders if any lessons were learned — and what lies ahead. Under the cover of darkness early Sunday morning, the last 500 U.S. combat troops sped out of Iraq in a 110-vehicle convoy to Kuwait, a departure kept secret even from Iraqi allies to avoid possible leaks to militants who might have inflicted one more ambush. 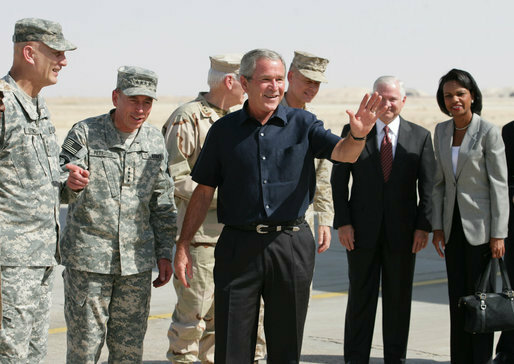 It was an ignominious end to an imperial adventure that cost around $1 trillion and left nearly 4,500 U.S. soldiers dead, along with uncounted hundreds of thousands of Iraqis, not to mention many thousands more injured and maimed. Iraq’s infrastructure also remains devastated by the war, and there is the strong possibility that sectarian tensions will again erupt into violence. With a new round of political arrests just this weekend, many Iraqis fear they may have traded one dictator, secular Sunni Saddam Hussein, for another tyrant, Shiite Nouri al-Maliki, today’s strongman prime minister. The United States will try to extend its influence and get some “value” for its massive investment but without tens of thousands of troops to deploy and without tens of billions of dollars to throw around, it is hard to envision how that will work. The arc of American power is clearly on the decline. 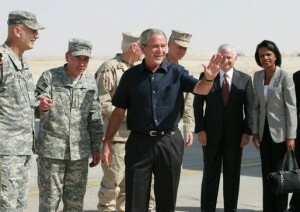 Most of the Iraqis quoted by the New York Times on Monday expressed relief that the American troops had finally left. Indeed, the U.S. departure represents a hard-fought victory for the Iraqi resistance, including anti-American Shiite leader Moktada al-Sadr whose political influence with the Maliki government was a key factor in Maliki’s rejection of American requests to leave behind a “residual” military force. Strategically, Shiite-ruled Iran, which has close ties to both Maliki and Sadr, seems to have gained the most from the U.S. toppling of Iran’s longtime nemesis, Saddam Hussein. Iran also worked behind the scenes to pressure Maliki into rejecting long-term U.S. bases that could be used to threaten Iran. The impact of the war domestically is also unclear. Without doubt, the war’s costs contributed to the vast U.S. budget deficit, which has spurred activism from both sides of the political spectrum. The right-wing Tea Party demands austerity at home, while Occupy Wall Street protesters push back against policies that favor military contractors and the rich. But which argument will prevail is uncertain. Another consequence of the Iraq War and its WMD falsehoods has been a deeper public skepticism toward whatever the government says. Today, some on the Left don’t even believe that the war is really over, seeing the withdrawal as just a P.R. subterfuge. However, as much as some things have changed, others remain the same. The neoconservatives, who dreamt up the war, still have not given up their dream of exploiting America’s advanced military technology to reshape the Middle East and eliminate Muslim governments that are deemed a threat to U.S. or Israeli interests. The neocons, who remain very influential at Official Washington’s leading think tanks and best-read op-ed pages, admit that mistakes were made early on in the war and that their cheery vision of happy Iraqis throwing flowers and candy at the U.S. invaders was a tad over-optimistic. But the neocons are pushing the theme that their “successful surge” in 2007 “won” the war before President Barack Obama threw away their “victory” for political reasons. However, the evidence actually points to the “surge,” which cost nearly 1,000 U.S. lives, as a minor factor in the gradual decline in Iraqi violence. More important developments were the payoffs to Sunni militants in 2006 before the “surge” and back-channel deals between Maliki and Sadr to get Shiite militias to stand down in exchange for a U.S. withdrawal timetable. It was President George W. Bush’s grudging acceptance of a timetable that committed U.S. troops to leave by a fixed date, the end of 2011, that appears to have been the greatest single explanation for the drop-off in attacks against U.S. military personnel. However, Official Washington largely bought the neocon myth that the “surge” did it. Among the American people, it seems most are inclined to put the disastrous near-nine-year war out of mind and to focus on the Christmas holidays. However, there are sure to be recriminations among Washington’s chattering class during Campaign 2012. Indeed, given the U.S. news media’s failure to have learned lasting lessons from getting snookered in 2002-2003 over Bush’s false WMD claims, it is very possible that the neocons will ride back into power behind a new Republican president in 2013, with a renewed determination to start a new Middle East war, this time against Iran. It’s also possible that Obama could be mouse-trapped into an Israeli-instigated war against Iran, especially if Israel decides to strike Iran’s alleged nuclear weapons program before Election 2012. Obama may see little choice but to stand shoulder-to-shoulder with Israel. It should be remembered that the last two U.S. presidents who got themselves on Israel’s bad side, Democrat Jimmy Carter in 1980 and Republican George H.W. Bush in 1988, went down to electoral defeat. Many of the leading Republican presidential contenders sense this political opportunity to drive a wedge between pro-Israel Jewish voters and Democrats. That helps explain the current GOP competition for taking the toughest pro-Israeli positions (although it is also a pander to many Christian fundamentalists). The stance of former House Speaker Newt Gingrich calling the Palestinians an “invented people” and dismissing them as “terrorists” is even more extreme than the positions of Israel’s Likud Prime Minister Benjamin Netanyahu. Indeed, Gingrich seems to be laying the groundwork for ethnically cleansing the West Bank of Palestinians. So, it is possible maybe even likely that the American military withdrawal from Iraq will represent only a respite before a new round of fear-mongering, word-twisting and chest-thumping leads the United States into another Middle East war. Well, had I lived in either Viet Nam or Iraq I would have wished that America would have found a better way to “help” us. The future will tell if you are right, but it appears to me to be a dream. I was a common thought of the old British Foeign Office that Iraq could only be rules with a strong Sunni strongman and the US followed that policy until Saddam Hussein lost his sense and started the Iraq-Iran war. The US willingly helped him until he went too far and invaded Kuwait. So they turned against him and tacitly lost a war to Iran. The Iranians “had a good war” and are the victors. How the American Empire is diminished. Not diminished – gone. How did the US lose in Viet Nam, destroy Iraq, and still lose it to a people that could not begin to match the “overwhelming” superiority of our modern weaponry? And the neocons want to go into Iran? This meets Einstein’s definition of insanity (pursue the same failed policies and expect a different outcome next time). This insanity is gravitational. Neocons live in a fantasy world.